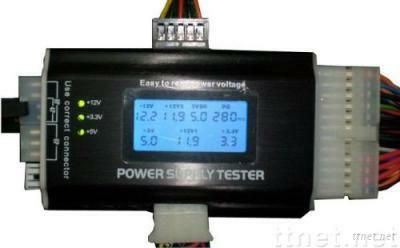 Features: * Easy to check ATX Power Supply performance * LCD screen * ATX P.G values display * Lower or higher P.G values alarm * ATX output connectors check * Over voltage alarm * No voltage detected alarm * Lower voltage detected alarm PG Auto Warning, LCD show each output voltage circs Use in 24Pin ATX Power Supply, 8Pin & 6Pin & 4Pin & SATA Product Introduction The LCD-1 power supply tester is a robust voltage, tester for PC-power supply. ATX, BTX and ITX compliant, power supplies can be tested. LCD?s indicate the status of voltage. The PC/SPS is suitable for the ambitious hobby user, as well as for a quick functional check in specialized trade.